Hello everyone – my name is Becky Smethurst and I’m the latest addition to the Galaxy Zoo team as a graduate student at the University of Oxford. This is my first post (hopefully of many more) on the Galaxy Zoo blog – enjoy! So far there have been over 100 scientific research papers published which make use of your classifications, some of which have been written by the select few Galaxy Zoo PhD students (most of us are also previous Zooites). The most recently accepted article was written by Edmund, who wrote a blog post earlier this year on how bars affect the evolution of galaxies. As part of the astrobites website, which is a reader’s digest of research papers for undergraduate students, I wrote an article summarising his latest paper. Since the Zooniverse team know how amazing the Galaxy Zoo Citizen Scientists are, we thought we’d repost it here for you lot to read and understand too. You can see the original article on astrobites here, or read on below. Galactic bars are a phenomenon that were first catalogued by Edwin Hubble in his galaxy classification scheme and are now known to exist in at least two-thirds of disc galaxies in the local Universe (see Figure 1 for an example galaxy). Throughout the literature, bars have been associated with the existence of spiral arms, rings, pseudobulges, star formation and even Active Galactic Nuclei. Our understanding of the processes by which bars form and how they consequently affect their host galaxies however, is still limited. In order to tackle this problem, the authors study the behaviour of bars in visually classified disc galaxies by looking at the specific star formation rate (SSFR; the star formation rate as a fraction of the total mass of the galaxy) and the properties of their inner structure. 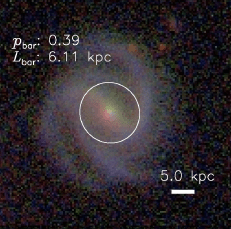 The authors make use of the catalogued data from the Galaxy Zoo 2 project which asks Citizen Scientists to classify galaxies according to their shape and visual properties (more commonly known as morphology). They particularly make use of the parameter from the Galaxy Zoo 2 data release, which gives the fraction of volunteers who classified a given galaxy as having a bar. It can be thought of as the likelihood of the galaxy having a bar (i.e. if 7 people out of 10 classified the galaxy as having a bar, then the likelihood is = 0.7). Thanks for a most interesting blog post. It seems there are three choices for discussing it: here (comments on the blog post), in astrobites (comments on your astrobites post), and in GZ Talk. To keep this within the Zooniverse universe, and taking up Kyle Willett’s suggestion (in a comment on an earlier blog post), I started a thread in GZ Talk: Discussion of: Bars as Drivers of Galactic Evolution. Later today – hopefully – I’ll have some questions, which I’ll post in the GZ Talk thread; looking forward to joining you in discussion there!